Thanks to its 20 MP camera and the Snapdragon 800 processor, Sony's upcoming Xperia i1 is expected to shoot 4K video footage! Expected to make its first official appearance on the 4th of September in Berlin at the IFA 2013 show, the Sony Xperia i1 Honami is one handset to keep an eye on, even at this early stage. Not much is official so far, but a lot of rumors about this smartphone and its innovative features have been published in the last few weeks. 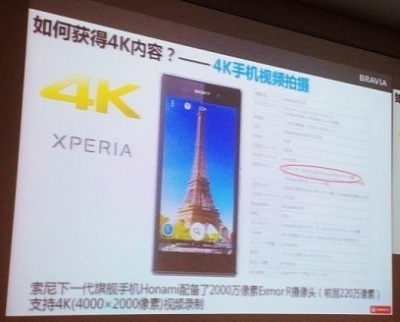 Today, a leaked picture from a presentation showing the Sony Xperia i1 suggests that Sony's upcoming flagship smartphone will become one of the first ones capable of recording 4K video. The 20.7 MP ExmorRS sensor featuring Sony's Bionz image processing technology will handle this tough task, together with the 2.2 GHz Snapdragon 800 processor. Additional features of this handset are expected to include a 5-inch 1080p multitouch display, 2 GB of memory and 16 GB of internal storage, Android Jelly Bean and more. Even for those who already own a Samsung Galaxy S4 Zoom or a Nokia Lumia 1020, the Sony Xperia i1 may prove to be a really tempting alternative. Since the first firmware for the Honami has already been certified by the PTCRB, its official unveiling should be only a few weeks away now.